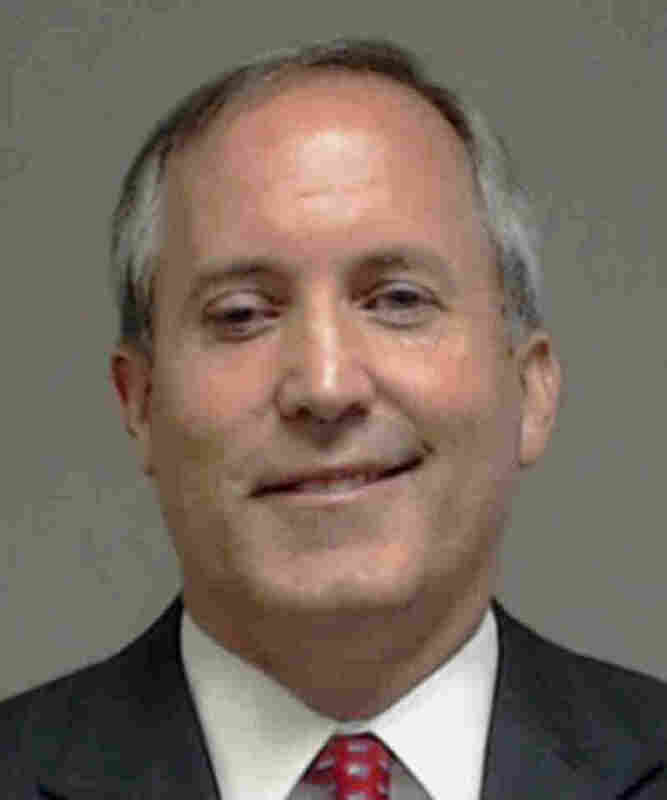 Texas Attorney General Turns Himself In On Fraud Charges : The Two-Way Facing three felony charges of securities fraud, Ken Paxton was processed at a county jail and released on bail Monday morning. Facing securities fraud charges, Texas Attorney General Ken Paxton turned himself in at a jail in Collin County, Texas, on Monday morning. A grand jury recently indicted Paxton on three felony charges that accuse him of misleading investors into a technology company. "Two of the charges — first-degree felony securities fraud — carry the possibility of hefty jail sentences," reports member station KUT in Austin. KUT adds, "Paxton can legally remain in office while under indictment, as the case could take years to run through trials and appeals." Noting that Collin County is known for placing a white towel around all suspects' necks, to minimize any possible biases in their appearance, local TV Fox 4 News says that this morning, the Texas attorney general "was allowed to take a mugshot without the white towel around his neck." The station says that Paxton "immediately posted his $35,000 bond and was released. He left again with his security team." "Paxton is accused of fraud, of deceptively luring investors in 2011 into bankrolling a Texas technology company called Servergy. Paxton is charged with misleading his clients by failing to inform them that he was receiving a commission from Servergy for lining up investors. "Paxton allegedly pretended to be an investor in the company himself. The attorney general has denied the charges." News that Paxton had been indicted broke over the weekend. As the Two-Way reported, the charges also accuse Paxton of failing to register as an investment adviser or representative.